Unable to connect to the database: The server took too long to respond. I'm running version 2.6 alpha build 216. Any ideas? Please also enable "Settings > Application-wide settings > Advanced > Miscellaneous > Report database errors as bugs" and disable the item about reporting recognised errors, then reproduce the error, submit an error report when prompted, then restore the menu settings to their previous settings. Please also try connecting to an SQL Server instance on another PC. Data table configuration screen shot. Server runs Windows Server 2003. Please let me know what specific details you need about it. My PC runs Windows XP Professional sp 3. I submitted the error report as requested. I can try connecting from a different PC in a few minutes. Can other software connect to the same database? You are using Windows Authentication, could you please check that there isn't an authentication pop-up showing and may be hidden behind some windows. 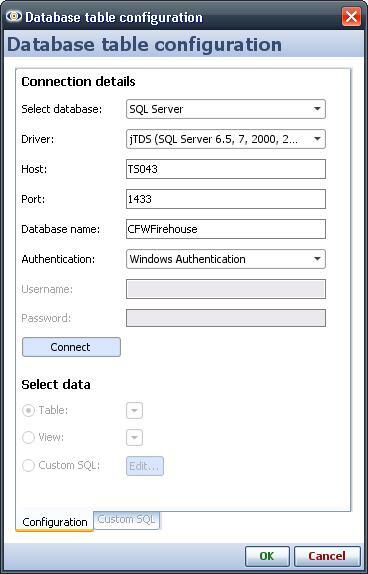 If there isn't, use SQL Server Authentication which requires username and password? 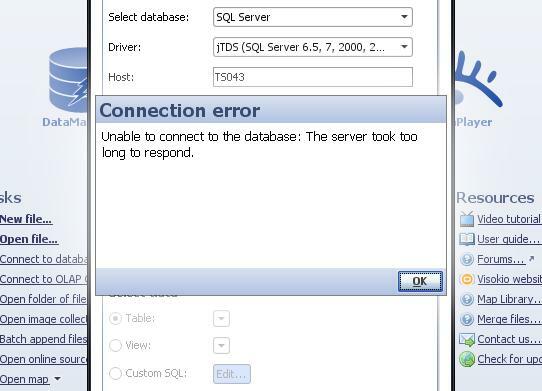 If the above does not work, in the Driver drop-down, select SQL Server 2005 driver and try connecting. Yes, other software connects fine. I tried using SQL Server authentication, and I tried selecting the SQL Server 2005 driver. I get the same error. This is almost certainly a proxy settings issue. Mohamed, please can you advise? 1. Edit this file "C:\Program Files\Visokio Omniscope\installconfig.properties". 3. Save the file . 5. Connect to your database.